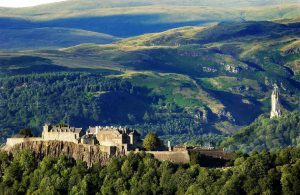 Stirling has a rich heritage which includes some of Scotland’s most important historical sites. Its history is probably one of the most famous in the world, especially since the major motion picture ‘Braveheart’ was released. Stirling Castle is situated at the head of the Old Town, mounted high on an old volcanic outcrop. It dominates the city skyline and is an enchanting place to visit. This is a great place to soak up views of the city including major landmarks like the Wallace Monument. The craggy outline of Dumyat and the scenic Ochils that lie beyond is a must visit. People who wander through the old town will discover the Church of the Holy Rude as well as the atmospheric Old Town Jail. One of the most enchanting places to view Stirling from is the top of Wallace Monument, which is a magnificent Victorian tower that is set on a rocky crag above the river and can be seen for many miles. Stirling has a range of galleries showing work from contemporary, conceptual pieces to crafts and framework for sale. Visit the Macrobert Arts Center, Changing Room Contemporary Art Gallery and the Fotheringham Gallery. There are various musical and theatrical events organized from antique fairs to alternative music festivals. A number of quality restaurants have opened up in the town center, as well as many lively pubs and bars. The Thistles Mall and surrounding precinct are home to all the well-known shopping brands. Stirling is very close to the two strongest cultural cities in Scotland – Glasgow and Edinburgh. Two and a half miles to the north of Stirling is the town of Bridge. Just a short drive to the north of Stirling is Dunblane, an important center since the 7th century. Eight miles northwest of Stirling is the village of Doune, the location for the filming of Monty Python and the Holy Grail.